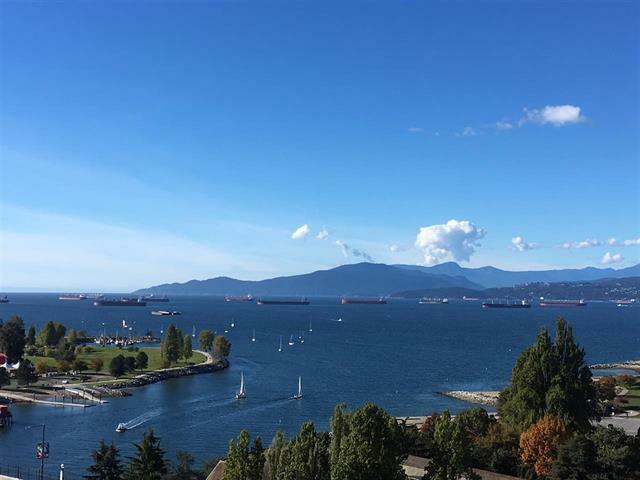 Rare opportunity available for unobstructed waterfront view from main rooms. Ideally located in the Beach District just steps to the Seawall and Granville Island Ferries. Unit is well laid out with 2 bdrm, 2 bath, in suite laundry and 1 parking. Kitchen recently renovated with new custom cabinets, quartz counters, SS appliances. Well maintained building with major upgrades completed in last 5 years. Exterior envelope rain-screen in 2015, full interior plumbing re-piping 2017. Amenities include pool, hot tub, sauna, squash court, exercise room. Rental and pet friendly building. West facing unit guarantees amazing sunsets and a great view of annual fireworks.